Kensington, MD (July 30, 2018) – The dude arrives. North Star Games is excited to introduce its brand new game dude, now available exclusively at Target and Target.com. The game dude celebrates the versatility of a word that can be a question (dude? ), an exclamation (dude! ), an objection (DUDE), an expression of wonder (dooode), and many other things. 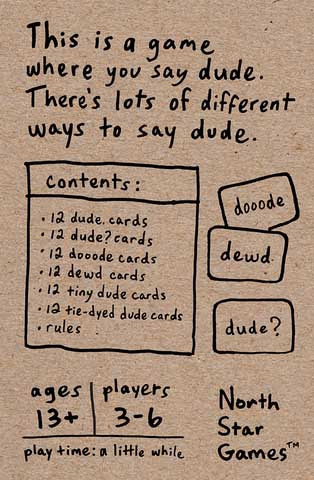 To play dude, each player has a set of cards that shows the word “dude” in 6 different ways. Everyone sits around the table saying “dude” in these different ways, all at once. You try to match with someone who you think is saying “dude” in the same way you are. If saying “dude” was not enough for one game, North Star Games is also simultaneously releasing a second game called more dude. Similar to dude, more dude also consists of saying the word “dude” over and over again, but this time players must say it as a robot, a surfer, or any other number of crazy characters shown on the cards. 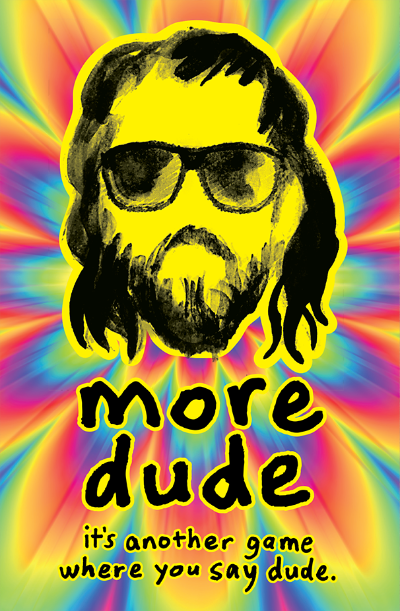 dude and more dude are now available exclusively at Target Stores and Target.com for $10.99. Through August 11th, customers can get 10% off of dude here, and 10% off of more dude here, using the promo code: GENCON. dude and more dude: Ages: 13+; Players: 3 – 6; MSRP: $10.99. About North Star Games – North Star Games is the publisher of award-winning party, family, and strategy games. Wits & Wagers is the most award-winning party game in history, Evolution is used in the Evolutionary Biology Department at the University of Oxford, and Happy Salmon has become a gaming phenomenon. For more information on these games and more, visit www.NorthStarGames.com. Editor’s Note: Dude, we have no idea.